You have an empty space? You empty space, can make money if you are kind enough to share the empty space with chicken. Chicken can grow and develop properly in the empty space that is dry and not humid. 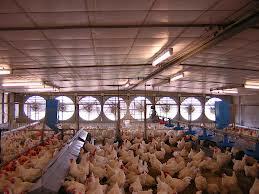 Broiler or chicken pieces can be harvested at 36 days with intensive care. So how much money can be generated to maintain the money? In East Java Indonesia, the price of chicken meat per kilo Rp 25.000, - or about $ 2.5. One chickens weigh up to 2kg. So the chickens can be sold diharga Rp 50.000, - or $ 5. One square meter can accommodate 5 to 6 chickens. This means that every square meter of empty space you can generate Rp250,000, - or $ 25. If you have an empty space with a length of 3 meters and a width of 3 meters then your space can accommodate 45 chickens. And, it means empty space you can provide monthly income of Rp 50.000, - / head x 45 heads = Rp2.250.000, - or $ 225. Not bad for an empty space unused.